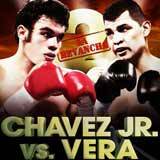 Review: 2014-03-01, good second fight between Julio Cesar Chavez Jr and Brian Vera: it gets three stars. Julio Cesar Chavez Jr entered this fight with a pro boxing record of 47-1-1 (32 knockouts) and he is ranked as the No.4 super middleweight in the world, he suffered his only defeat against current #1 Sergio ‘Maravilla’ Martinez in 2012 (=Martinez vs Chavez Jr), since then he fought only once facing Vera in their first fight, the Mexican won the bout but it was a very controversial decision (=Chavez Jr vs Vera I). His opponent, Brian Vera, has an official record of 23-7-0 (14 knockouts) and he entered as the No.12 in the same weight class. Chavez Jr vs Vera 2 is valid for the vacant WBC Continental Americas super middleweight title. Watch the video and rate this fight!